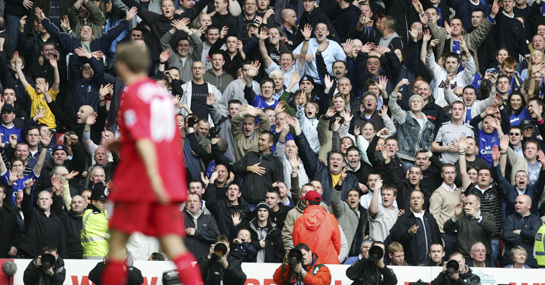 There is always a sense that any game between Liverpool and Everton can spill over and become a rather grisly affair – and the past decade has been no different. Since the 2001/02 season there have been 13 sendings off in 22 Merseyside derbies. However, nine of the players to see red have been wearing blue. Everton have had two players sent off in a single game on three separate occasions during that period. David Weir and Gary Naysmith were both sent packing in their 2-1 defeat against the Reds at Goodison Park in 2003. Phil Neville and Mikel Arteta saw red in their 3-1 home defeat in 2005, while Tony Hibbert and Neville, again, were sent off in another home loss in 2007. However, even when Liverpool players are the ones taking an early bath, the Reds still tend to come out on top. Milan Baros, Steven Gerrard and Sotiros Kyrgiakos have all been sent off against the Toffees in the past decade and each time Liverpool have still come away with three points. In fact, Everton have won only one of the eight games in the past ten years that has seen a player sent off. That was an FA Cup reply in 2009 in which Lucas was red carded and Everton still needed extra-time to scrape through 1-0. If things start to get a little heated at Goodison this Saturday, then backing Liverpool – who are currently 6/4 favouirtes – to get all three points looks well worth a bet.